Terms: Projects can be selected from the topics below or another project idea can be proposed. Project details and completion criteria will be finalized via mutual agreement between the student, the student’s high school/college preceptor (if applicable), and the Mentor (Lesa R. Walker, MD, MPH). Projects will be independent study with regular meetings/updates/reports with the school/college preceptor (if applicable) and Mentor for planning/discussion/guidance/updates, etc. Depending on timing, the project may involve a “Citizen Communication” to the Austin City Council as part of the ongoing sharing with the Council about Compassionate Austin activities. Resources: Compassionate Austin website: www.compassionateaustin.org and those indicated below in the “Project Options”. Work with one or more of the following organizations: the Charter for Compassion International, a Charter for Compassion International Partner, and/or the Compassion Games International (student works with local mentor and collaborating international organization mentor). Internship project availability and specific project activities to be determined following discussion via conference call with the student and both mentors. Interview schools, organizations, businesses, etc. around town to identify their compassionate action profiles (description of their compassionate action in the 3 dimensions of caring for others, self, and the Earth) and provide them with Compassionate Austin Recognition Badges that they can put on their websites (and post on social media). As part of this interview and data-gathering process, create a Kumu map (similar to https://kumu.io/UnLtdUSA/austin-social-entrepreneurship) of all the entities with Compassionate Austin badges. Bring “The Forgiveness Project” exhibition to UT: http://theforgivenessproject.com/programmes/exhibition/. Do all the logistics to make this happen. Possible collaboration with the Blanton Museum of Art. Possibly arrange to have a panel discussion or symposium to coincide with the exhibit. Photo journalism of 3D compassion (caring for others, self, and the Earth) in Austin and vicinity- capturing images that reflect/represent compassion in our community (signage, service, workplace activities, events). [I have some examples, if needed]. Photos can be posted to Compassionate Austin Instagram (#compassionup), or Twitter (@compassionup) or Facebook (https://www.facebook.com/compassionateaustin). Photos could be developed into an artistic display for a space at UT. Photos could be arranged in a collage to manifest a larger image of compassion. Create a blog with the photos and their meaning. Report about this experience and the personal exploration and discovery. Interview people in Austin to capture stories of compassionate action (for others, or self, or Earth). Possibility- create an audio or video archive of compassionate action stories in Austin. This can tie into the work done in the past by the students in the University of Texas at Austin (UT) School of Business (as part of their Service Learning Project with the Austin Symphony Orchestra). They started a collection of videos of people’s stories of compassion. UT Business School contact: Professor Karen Landolt at Karen.landolt@mccombs.utexas.edu (512-232-8193). Explore the Compassionate Austin website (compassionateaustin.org) and select one or more things from the website to do to strengthen 3D compassion. Report on the experience. Participate in a service project/activity. Read how Austin evaluates its unmet needs and compassionate action impact. 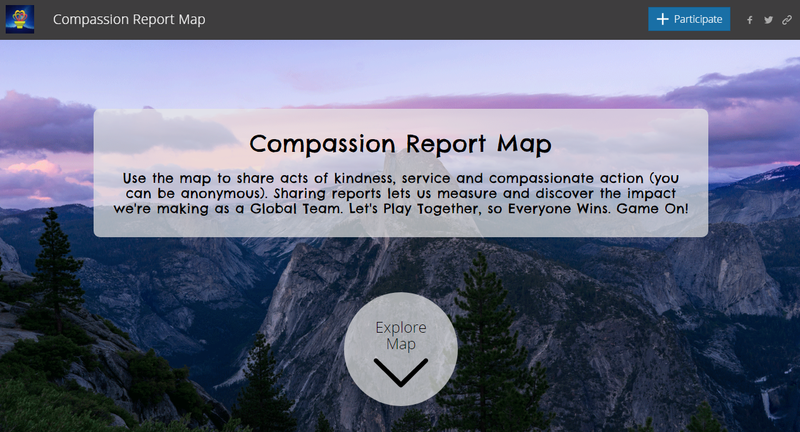 Explore how to create a tool to measure community compassion strength. The global Games are 5X/yr. : September, December, January, February, and April. The September Global Unity Games focus on peace and are from 9/11 thru 9/21 (the International Day of Peace). The November/December Giving Games focus on schools and education and start with “Giving Tuesday” (with adjusted dates each year). The January Games are on MLK Weekend. The February World Harmony Games are associated with World Interfaith Harmony Week. The April Earth Week Games are associated with Earth Day and focus on the environment. One very simple way to participate in the global Games is to register and sign up to receive daily “Secret Agent of Compassion” missions for each day of the Games. People can informally “play” the Games anytime. So, if students want to set up their own time for the Games on campus, that is fine. The Compassion Games website: www.compassiongames.org has a wealth of information about ways to engage in 3D compassionate action/service. However, the sky’s the limit- anyone can create his/her own projects/actions as a way to participate. Students could take a leadership role in rallying other students and the Austin community as a whole to participate in the Compassion Games. On April 14, 2016 the Austin City Council passed a Resolution designating Austin as a Compassionate City. As part of the Resolution, the Council encouraged all of Austin to participate in the Compassion Games. Read about the Compassionate Cities campaign and think of and implement ways to create dialog between Austin and other compassionate communities around the world. Perhaps reach out to an Austin “sister-city” in another country. Read about Compassionate Colleges and Universities and have dialog with students from these colleges/universities about their activities and perhaps do a joint project together. Take a course offered via the Charter Education Institute: http://www.charterforcompassion.org/index.php/emotional-intelligence-for-a-compassionate-world. Download the free “Compassion Today!” mobile app (http://compassiontoday.mobapp.at/) and use it daily for a period of time to explore compassion in our world and increase awareness and knowledge. Journal/report about this experience. Do the 3 Daily Question exercise (https://compassionateatx.wordpress.com/3-daily-questions-exercise/) for a specified period of time and journal about the experience daily. Report at the end of the time period about this experience and its impact. Engage with students in a brainstorming/strategic planning session to develop ways to message and engage the Austin community in 3D compassion. Develop and produce a “We Are Compassionate Austin” decal that can be displayed in windows of Austin businesses, schools, homes etc. and brainstorm ways of dissemination. Get a sponsor organization such as “Build A Sign” in Austin. Pilot/participate in a Neighborhood “Compassion Watch” (along the lines of the established “Neighborhood Crime Watch” system, but focused on, discovering, and highlighting the 3D compassionate actions in the neighborhood). Work with one or more Neighborhood Associations. Explore and report on the latest compassion research: the self-compassion research of University of Texas at Austin professor, Dr. Kristen Neff; Stanford University’s “Center for Compassion and Altruism Research and Education” (CCARE); University of California at Berkeley‘s “Greater Good Science Center”; etc. Develop a “3D Compassion Practice” self-study course that would include the options above. This course could be a model for other colleges/universities and shared globally through the Compassionate Communities network and submitted for inclusion in the Charter’s Education Institute offerings. *For all of these activities, students can do a pre and post personal compassion practice strength survey: https://compassionateatx.wordpress.com/compassion-practice-strength-survey/.